Kellogg's Center for Nonprofit Management hosted its 3rd annual conference on May 2 at the James L. Allen Center. "Innovating Social Change" brought together dynamic keynote speakers and panelists to explore how business principles and nonprofit practice intersect. 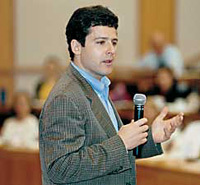 Said Donald Haider, professor of public management and director of the school's nonprofit center, "With increased demands on nonprofit organizations to demonstrate accountability and efficiency, 'Innovating Social Change' has been designed to highlight the application of cutting edge business practices to the nonprofit sector." Jeffrey B. Swartz, president and CEO of The Timberland Co., began the conference with a motivational keynote that assessed his company's success in meeting its social goals while remaining competitive. "Timberland has people who come to work and believe that their job is about more than just clothes; it's about making a difference," said Swartz. "It's past due for us to have this conversation. The hungry have not vanished from the land, and the weak are still among us," he added. The CEO of the $1.09 billion footwear, apparel and accessories brand also reflected on the origin of his company, founded by his grandfather, saying, "These were passionate people who believed that businesses should do well [financially] by doing good [socially]." Later, John McCarter presented a keynote detailing the social good advanced by Chicago's Field Museum, where he serves as president and CEO. McCarter outlined the "enormous leadership similarities" between for-profit and nonprofit organizations. He also described the museum's many conservatory initiatives. The day's final keynote was offered by Ginna Zinke '90, a social entrepreneur and co-founder of Sustainable Leaders.com, a consulting practice that builds alliances between corporations and nonprofits.